Ah, single-serve. There are plenty of perks encompassed in those two words for coffee drinkers, especially those who find themselves in a zombie-like state prior to taking in caffeine. This round up of the best single-serve coffee makers in 2019 can take the guessing out of measuring and provide a single (duh), neat portion of the piping hot good stuff. Nespresso, Lavazza, and Mars, Inc. are three of the first to create single-serve coffee makers, and those three hit the market in the late 70s and early 80s. They were followed by Green Mountain Coffee Roasters (which most of the general population knows better as Keurig) and ESE, but Kraft wouldn’t jump on this bandwagon until 2004. Despite the number of machines on the market, this single-serve trend wouldn’t really hit its prime until nearly 2013, with people spending $2.5 billion on instant or ready-to-make coffee. Single-serve coffee makers are all about ease and convenience. Every pod delivers a fresh cup of coffee, it quickens the brewing process, and it’s completely foolproof. No matter what level of coffee lover you clock in at, master barista or casual dabbler, a good single-serve machine won’t let you screw up a decent cup of joe. When looking for a single-serve machine, you’ll want to consider a few different things. Namely, there’s the cost of the pods, the variety of coffee flavors and types those pods come in, required clean-up, and reservoir size. For a 2-coffee per day habit, you can spend over $400 dollars just for the coffee pods alone, and some single-serve machines have a more limited selection of coffee flavors and brands. Some are available with reusable pods that can be filled with your favorite grounds, and they also cut down on waste. If you’re dedicated to remaining environmentally friendly while choosing a single-serve machine that uses pods, you’ll definitely want make sure it comes with a reusable cup. There are also options on the market with reusable baskets that work the same way as larger coffee machines — it all depends upon your needs. That all being said, single-serve coffee machines are great for a multitude of coffee drinkers, so let’s check out some of the options on the market and figure out which one will complement your morning routine the best! We’ll start small and work our way up — you’ll see what that means in a hot second. Here’s how I imagine this single-serve brewer going: you live alone or are the only coffee drinker in the household. You drink your coffee on a decent-lengthed commute, either train or highway. You like to keep things pretty streamlined, which is where the the Brew ‘n Go comes into play. 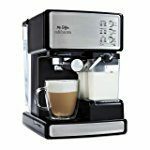 This cute little machine takes up minimal space on your counter, makes 15 oz. of coffee, and it drips directly into a travel mug. The one-button start function is ideal for that life on-the-go. No muss, no fuss, no coconuts. Unless you enjoy coconut coffee, that is. No judgement here. I imagine the same exact scenario in my head for the Hamilton Beach Single-Serve, but the long commute is optional. This one boasts a stainless-steel look, so it comes down to personal preference in that regard. It caps off its reservoir at 14 oz. This little trucker is fancier than its sticker price indicates, though. You can brew a cup of either Regular or Bold coffee and in two different sizes, either 8 or 14 oz. They take 90 seconds and 2.5 minutes to fill your cup, respectively, and the built-in mesh filter means you won’t be spending moola on pods or capsules. We’re upping the ante here, both in reservoir size and capability. This model is definitely for the coffee connoisseur in us all. Opt for the version with a built-in frother and really acquire that instagram-worthy picture of your morning cup without leaving your very own kitchen. It offers multiple brewing sizes ranging from Cup to XL Multi-serve, but it’s reservoir is limited to 22 oz. before needing a refill, so keep that in mind. There are also a number of ways to brew your grounds, from Classic to Rich to Specialty, which adds a dash of fancy to your rocket fuel that definitely can’t be attained in simpler models. If the Ninja Coffee Bar Single-Serve System didn’t prove it already, single-serve coffee doesn’t have to be minimal — not if you don’t want it to be, at any rate. The Nespresso Inissia Espresso Machine continues down that vein, and it also begins our discussion about pods. This beaut has a quirky design, a remarkably quick heat up and brew time, can be purchased with a frother (called an Aeroccino), and has a high-pressure pump that produces up to 19 bars. That means you can make espresso shots, if you’re wondering why I’m throwing that measurement at you. The world is your oyster if your want to drop a Benjamin and a coupla twenties for this Nespresso. The frother is not attached and costs a fair chunk of change to add on to the purchase. I just want to throw a wrench into the works here, because there is such a thing as having the best of both worlds. This iteration takes all of the cool aspects of a single serve brewer and just kind of mashes it together with a full-pot brewer. Because, you know, you’re not just a one-dimension kind of person, so why should you only be able to make coffee one way? The single-serve side can make up to 14 oz., while the Full Pot Coffee Maker yields 12 cups. While they don’t break this down into ounces, the assumption is that a cup equals 6 oz, so that’s a 72-oz. reservoir. Has a single-serve function of up to 14 oz. I’ve been talking a lot about fancy-schmancy options, mostly because I’m fantasizing about smooth layers of foam and working on deluding myself into thinking that I’ll actually have any interest in using a frother at 6 am. Ha. Ha, ha, and ha. The Keurig K55 is a more no-nonsense type of machine, but it still features options that you’ll really appreciate, especially if you’re a black coffee drinker. There’s no frother or milk dispenser or any of that on the K55, but it has a 48 oz. reservoir, three cup sizes to choose from, and an auto-on feature so it’ll rise and brew before you’ve hit snooze the first time. Or fifth. You know how it rolls sometimes. If you need more from your single-serve, these next few will warrant some due consideration. You’ll also have to remember this simple correlation: the larger the reservoir the higher the sticker price. The VertuoPlus Deluxe has a 60 oz. reservoir, and a price to match. It comes with a few other features that you may have never known you wanted though, including a moveable water tank that swivels around the machine. Prefer it to the left rather than the right? You can have your wish from this coffee-making genie. This high-tech number also doesn’t need any input from you. The barcodes on the pods tell the machine everything it needs to know — it makes all adjustments necessary to make you the perfect shot of espresso or cup of coffee without making you answer any hard questions, because what question isn’t difficult before that first cup of caffeinated goodness? Like its other iterations, you can add the Aeroccino onto this purchase if you want to dole out the extra cash. What you need to understand is that Keurig has a lot, and I mean a lot, of options on the market. They have offerings across the board, including this 70 oz. reservoir one. It can make single-serve cups as well as full carafes, but those large batches max out at 30 oz., require special pods, and the carafe is sold separately. The stand-out feature on this model is the touchscreen. Easily set auto-on and -off times, as well as your cup size, ranging from 4 oz. to 12 oz. It also boasts a temperature setting so, if you’re anything like me, you can make a “kids-temp” cuppa without having to actually verbalize it to the barista. Can brew multiple single-serve sizes, 4 to 12 oz. This is another one of those wrench-in-the-works makers. It’s especially useful for those who don’t dig an all-black cup of coffee. This model even has a milk reservoir and does the whole kit-and-caboodle for you, which is a huge perk if you’re not keen on frothing and mixing yourself. A one-touch control panel makes it super easy to get this model going and, despite Mr. Coffee being strangely secretive about the exact reservoir side, it’s neither large nor small. The big highlight on the Cafe Barista is that you can cut down on the fivers your spending on lattes, cappuccinos, even just cups of coffee at local chains. This machine can really do it all — no degree in magic beans required. Or barista school. Assess what you want to use your single serve coffee maker for. If you’re a lone wolf coffee drinker, the true single-serve coffee makers, with just a large enough reservoir for that one mug, it might be all you really need. On the other hand, if you’re trying to wean yourself off of your coffee-buying habits to save some cash in the long-run, I’d vote going for the real deal: the Mr. Coffee Cafe Barista Espresso and Cappuccino Maker — just go all in and enjoy all of your favorite cups for pennies on the dollar. If you’re a best-of-both-worlds type and want both a single-serve and pot, the Hamilton Beach 49980A would be my recommendation. There’s really no bad option here, though, just one that might be better for your lifestyle. So, fellow coffee-lover, take a seat. Cross your legs. Hum some ohms and figure out your needs. Only then will you be ready to click “Buy” and make one of these best single-serve coffee makers of 2019 your own.